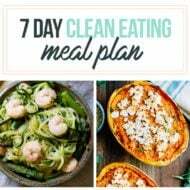 A 5 day clean eating meal plan and shopping list with healthy breakfast, lunch and dinner options for five days. All the recipes are flavorful, quick and easy! 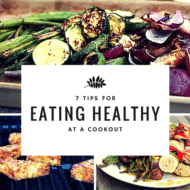 Are you ready to get back on track with healthy eating… more meal planing and cooking healthy meals at home, less sugar-filled goodies and wine? 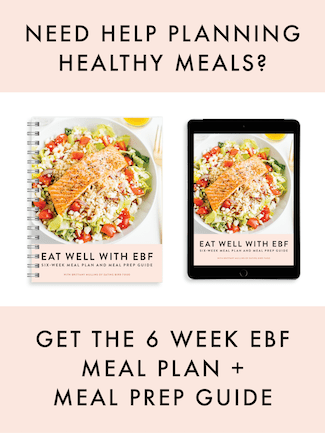 If so, you’re in the right place and I have a treat for you –> a 5 Day Clean Eating Meal Plan with healthy recipes. The meals are full of flavor, gluten-free friendly and many are vegetarian as well. Get started today! Some of the lunch and dinner recipes make multiple servings so you can have the leftover serving for lunch or dinner the next day. An example is the Detox Salad made on Monday night. You’ll use your leftover salad ingredients for lunch on Tuesday. I haven’t included snacks here, but please feel free to add in your own healthy snacks based on your dietary needs. L :: White Bean Quinoa Salad <— Make ahead on Sunday. 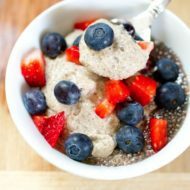 B :: Protein Overnight Oats <— Make ahead on Monday. L :: Salad in a Jar <— Make ahead on Tuesday night. Thank you, Amanda. I hope the meal plan is a helpful even if you do have to modify it a bit. Thank you so much for sharing this meal plan, Brittany! It’s very helpful and inspiring. Is the shopping list for only one person? Do I double if making for both my husband and myself? Thank you so much for sharing and I am looking forward to following it this week. Thank you so very much for sharing this plan. It’s come at the perfect time to get me back on the healthy track! Ive subscribed for this email and have no idea how to access these recipes (are they organized in an easy to print grocery list?) or do I have to click on each individual recipe? I was really hoping to have the 7 day plan to start off with. Thanks for your help I LOVE what I see so far! !